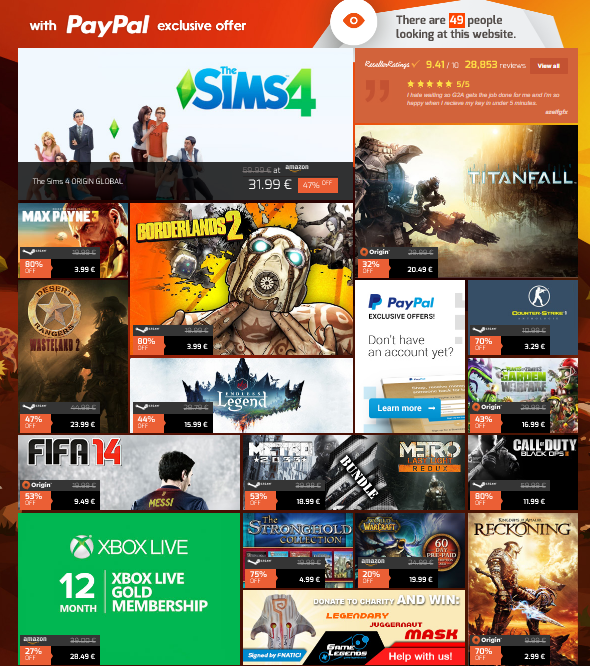 Buy lots of the recently released games with discounts already today! During a couple of last weeks, we’ve offered you to pre-order The Sims 4, Plants vs Zombies: Garden Warfare and Metro Redux Bundle with reductions, but today we’d like to suggest you buying these and other recently released games with discounts. So, this weekend, you are able to purchase Metro Redux Bundle - the compilation of the remastered and the improved Metro 2033 and Metro: Last Light games - for €18,99. Also, you can buy The Sims 4 Standard and Limited Editions for €31,99 and €33,99 respectively. For those who like fighting against zombies, G2A team has prepared Plants vs. Zombies: Garden Warfare game, which today costs only €16,99. 11) Call of Duty: Black Ops 2 STEAM CD-KEY (GLOBAL) is available for €11,99. This weekly sale, as always, begins today - on the 5th of September - at 15:00 GMT and will end on Monday - on the 8th of September - at the same time. It’s a good time to save your money, purchasing cool and especially recently released games with discounts, so don’t miss this chance!